Well, this series has been allowed a second week which is equally pleasing and surprising. For those of you that avoided the waves of self-promotion that washed over the first RetroMatch podcast piece then I should probably explain what we are up to. RetroMatch is where we, being Pete Spencer and I currently, randomly pick a match from the footballing archives and retell the story on our podcast and then, because why wouldn’t we, we tell the story again in the written form. 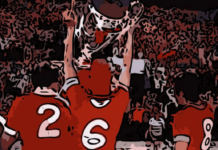 Last week was the 1977 European Cup Final where Liverpool finally got their hands on Europe’s most coveted prize, starting something of a dynasty for the next decade or so. Today, we jump forward almost exactly ten years to May 1987 and the FA Cup Final between Coventry City and Tottenham Hotspur. And what a final it was. The 1987 FA Cup Final was actually my first FA Cup Final. I was eight years old and the realisation was just starting to dawn on me that if I wanted to avoid getting picked on any further in the school playground then I’d better start getting into this thing called football. I was still just under a year away from choosing the English team I would follow for the rest of my life but that didn’t stop me, and my friend at school Paul Penman, telling the teacher that we thought Tottenham were going to lift the cup at Wembley. Of course, being eight, I was unaware that Tottenham had won every single FA Cup Final they had played in and, of course, that run was about to come to an end. It is a guilt that has never left me – I and my yet to be developed tragic tipster skills had destroyed Tottenham. Or maybe, just maybe they had that ability in their own lockers. May 1987 was an interesting place. Everton had just pipped their city rivals Liverpool to the First Division title, a title Liverpool had won the previous season. Arsenal had won the League Cup at Wembley with a goal from Charlie Nicholas and an own-goal from Liverpool’s Ronnie Whelan. I vaguely recall being aware of this match, so football was just starting to be part of my childlike awareness. Off the pitch. Maggie Thatcher had called a General Election for the summer and Starship were tearing up the dancefloors with ‘Nothing’s Going to Stop Us Now’. Chas and Dave were still milking the FA Cup cow with ‘Hot Shot Tottenham’. They certainly loved a London club getting to the Twin Towers. Tottenham came into the Wembley final as clear favourites. Not only were they unbeaten in FA Cup Finals, last winning the 1982 clash with QPR, they had finished 3rd in the First Division and reached the League Cup Semi-Finals. Some might say it was almost the perfect Tottenham season, a case of so close yet so far, but they still had the chance to end their campaign with silverware because, after all, they were only playing Coventry City. Coventry were expected by the masses to simply turn up, enjoy the day and then roll over to let Glenn Hoddle, Ossie Ardiles, Chris Waddle and Clive Allen tickle their collective bellies before climbing the famous old steps to lift the cup. Yet, Coventry City had not had an easy route to the Final. After the third round, they played every tie away from home – including a 1-0 win at Old Trafford against Alex Ferguson’s Manchester United, except, of course, it wasn’t quite Alex Ferguson’s Manchester United yet. Keith Houchen scored the winner against United, one of several crucial goals in Coventry’s historic run. The final was to be Glenn Hoddle’s final match for Tottenham Hotspur after over a decade of service to the club he joined as a schoolboy. The destination was yet unknown, but it turned out to be AS Monaco where he linked up with another man soon to leave his own mark on the football of North London, one Arsene Wenger. Hoddle’s announcement that he was leaving didn’t go down well in all quarters. A certain Brian Clough, never one to shy away from an opinion – even more so at this late stage in his career – said that he ‘wouldn’t have picked Hoddle himself as his heart could not be in it’. Considering that Hoddle was still thought of as Tottenham’s main man, this was an interesting angle from Clough. Spurs also had a very inform front man. Clive Allen had scored 48 goals before the whistle was blown at Wembley, a staggering total for a man playing in a team that didn’t actually win anything. Coventry City were not short of firepower either. The aforementioned Keith Houchen formed a formidable strike partnership in the Cup with Cyrille Regis, a Midlands legend. In the week leading up to Wembley, Regis had been linked with a move to Ajax Amsterdam – then managed by the great Johan Cruyff. History tells us that the move never happened. As the two sides lined up for kick-off, it was clear something was not quite right with Tottenham’s kit. They were wearing their new strip for the 1987/88 season, sponsored by the brewer Holsten. But, for reasons that have never been fully understood, only five (or maybe six – it was one way round or t’other) of the Spurs players wore a shirt with the sponsor’s logo on it. Years later a kitman has been blamed along with the club secretary. Some have suggested it was an advertising ploy by Holsten to draw more attention to themselves – genius if true, especially in 1987. Either way, the reaction in the executive box at Wembley was not favourable. The VIP guests from Holsten stormed out, threatening to pull their sponsorship. With hindsight, if both parties had realised that 31 years later this was still getting mentioned, Tottenham would have been well within their rights to request even more money. The game kicked off, Tottenham kicking from right to left playing in their fluid 451 shape honed by manager David Pleat in his time at Luton Town. Clive Allen was playing up front on his own, quickly supported by Hoddle and Waddle. Steve Hodge played to the left with Ossie Ardiles immediately looking like he was the deepest of the midfield five. And Tottenham struck first after only two minutes. Waddle cut back on to his left foot, a move that you just knew was coming but were powerless to stop. His near-post delivery was met in a flash by Clive Allen, quickly turning 48 into 49 for the season – a true poachers finish. Well that was going to be that, wasn’t it? You could almost see Tottenham get the cigars out as they trotted back to the centre-circle for the restart. Coventry City had other ideas and drew level seven minutes later. It was a classic Tottenham goal to concede, as I explain in the podcast – listen to it, you might agree with me. Dave Bennett, a losing finalist against Spurs in 1981, stole in at the far post to score past Clemence – a goal that both I and the great John Motson felt Clemence could have dealt with a little bit better. Coventry were set and looking good, having a good period of the ball and looking dangerous with it. Big Cyrille had what looked like a perfectly good goal chalked off – referee Neil Midgley deciding that Keith Houchen had given Gary Mabbutt a little nudge as the cross came in. It looked harsh and it rocked Coventry momentarily. Steve Ogrisovic, inexplicably, believed he could dribble the ball outside of his area and past Clive Allen who, less inexplicably, won the ball and went towards goal. Superb last-ditch, heroic, underdog defending from Trevor Peake blocked the first shot and then forced Allen wide enough to hit the side-netting with the second. The game was wide open and both teams were sticking to their pre-match promise of attacking, entertaining football. In a five-minute passage, both Tottenham centre-backs were seen playing 40-yard wall-passes and breaking into the Coventry City area, only to be denied. Gary Mabbutt was capable of playing in midfield but Richard Gough? Rangers bought him for his defensive skills. Then, as half-time approached, Oggy went one step further than his out-of-box antics and came for a cross that was not there to come for. Confusing his defenders, the ball went in off Brian Kilcline – Killer – although it was eventually credited to Gary Mabbutt. Tottenham had the lead, although Coventry still found time to nearly draw level again – Nick Pickering breaking in behind and forcing a fine block from Richard Gough. As with many finals that have had a thrilling, energetic first half the second half often fails to reach the same standard. This is true of the 1987 FA Cup Final, though the second half did give us one of the most iconic moments in FA Cup history. Oggy punts the ball long, again. Regis bullies Mabbutt in the air, again. Houchen lays the ball wide to Dave Bennett who runs at Tottenham, again. Bennett puts a ball into an area, the area. There is no Coventry player in shot and then, pam. Arriving from deep, a full-length-diving-both-feet-off-the-ground-diving-headering Keith Houchen appears and the ball flies past Clemence, this time faultless. It was a goal that befitted Coventry’s day, the goal that people would remember for generations yet to come. Houchen suddenly turned into Marco van Basten and was simply unplayable for fifteen minutes after the goal – would Johan Cruyff change his plans? 90 minutes ended 2-2 and it was clear Coventry had more left in their legs. Micky Gynn and Lloyd McGrath were now dominating the midfield and it was McGrath who broke down the right and put in the cross that led to Mabbutt agonisingly floating the ball up and over his own goalkeeper for Coventry City’s winner. It was a famous day for the Sky Blues, a day that their fans can still look back on with pride. As I said at the start, Pete Spencer and I talk about this incredible final for a good hour or so and I would really recommend that if you enjoyed this piece of nostalgia then you would love the podcast. You can get it in your ears here.